Blog: Can Lyrics Survive Without Music? Can Lyrics Survive Without Music? I have to take exception to one paragraph in John Jurgensen's otherwise expansive "The Secrets of Songwriters" article in yesterday's Wall Street Journal about lyricists. Divorced from a song, words on a page look like poetry--usually bad poetry. "Lyrics just don't hold up without the music," says Billy Collins, professor and former poet laureate. When his students argue that the lines by their favorite rock stars should be assessed as literature, he demurs: "I assure them that Jim Morrison is not a poet in any sense of the word." I couldn't disagree more. What about Stephin Merritt of The Magnetic Fields? Even the simplest of his lyrics, like the words to "The Book of Love" stands alone without the music, in my opinion. Or R. Kelly's careening "Trapped in the Closet" song cycle? Or the amazing lyricists that penned words for the songs of Schubert like Heine? I've been thinking about lyrics a lot lately as the upcoming VoiceBox show next Friday, August 20, is all about song words. 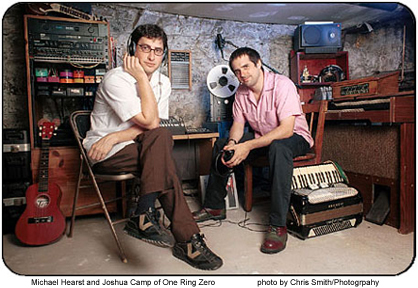 The discussion features Michael Hearst (pictured left), one of the co-founders of the alt rock band One Ring Zero, who came into the KALW studios last week on a visit from New York to record the segment. Hearst is a wordsmith who can craft songs out of lyrics that have no pretentions to being literature whatsoever: One of his current projects is to create an album of songs out of the recipes of celebrity chefs like Mario Batali. But he also knows poetry when he sees it. Tune in to our discussion next Friday from 10-11pm on KALW 91.7 FM San Francisco or online at www.kalw.org. The show will also be available for on demand streaming for the week following the broadcast date here. Speaking of the Wall Street Journal, the paper had another great article about singing in it from San Francisco by David LittleJohn all about the Merola opera program. Read it here.